Magic 98 and Kelly’s Market are fueling your day with the Magic Mug Fill-Up! Stop by the Kelly’s Market listed below and spin the Magic Prize Wheel to win a Magic Mug — which is good for one free fill-up of coffee or soda every day for the rest of the year! Here’s when and where to stop by for a chance to win… April 17 from 10-11AM at West Washington Mobil (636 W. Washington Ave., Madison) To see more Magic Mug Fill Up stops, click here! Join Madison Forward in their inaugural season at Breese Stevens Field on April 16 against North Texas SC! For ticket info, click here! Dane Handmade is an opportunity to showcase new mediums as well as new purposes for upcycled materials. Vendors goods vary from prints, woodworking, textiles, felting, pottery, jewelry, whimsical and earthy, and every show has new vendors to shop. Shoppers, expect the unexpected and purchase one-of-a-kind items in a casual, local shopping environment! For more information, click here. 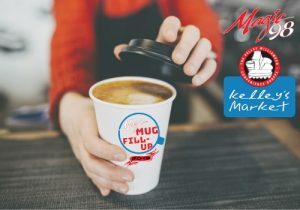 Magic 98 and Kelly’s Market are fueling your day with the Magic Mug Fill-Up! Stop by the Kelly’s Market listed below and spin the Magic Prize Wheel to win a Magic Mug — which is good for one free fill-up of coffee or soda every day for the rest of the year! Here’s when and where to stop by for a chance to win… April 10 from noon-1PM at Springfield Mobil (6859 County Hwy. K, Middleton) To see more Magic Mug Fill Up stops, click here! Magic 98 and Kelly’s Market are fueling your day with the Magic Mug Fill-Up! Stop by the Kelly’s Market listed below and spin the Magic Prize Wheel to win a Magic Mug — which is good for one free fill-up of coffee or soda every day for the rest of the year! Here’s when and where to stop by for a chance to win… April 3 from 7-8AM at Sun Prairie Mobil (276 Davison Dr., Sun Prairie) To see more Magic Mug Fill Up stops, click here! Join the Sun Prairie Fire & EMS St. Baldrick’s event, and whether you decide to shave your head, volunteer, or donate, we hope you’ll be a part of the excitement! The St. Baldrick’s Foundation is a volunteer-powered charity that funds more in childhood cancer research grants than any organization except the U.S. government. Get involved and you’ll be giving hope to infants, children, teens and young adults fighting childhood cancers! For more information on the Sun Prairie event, click here.